The events in my life plays out like a series of "firsts". I feel like I've fallen in love a million times and could defnitely fall in love a million more. Defining love and trying to pin point who or what, exactly, is my first love has been a difficult task. I look back on my life and associate my first love with my first heartbreak. My first heartbreak is the guy I first held hands with. It was so sweet, so innocent how he went from the first guy I was really, truly into to my first heartbreak. 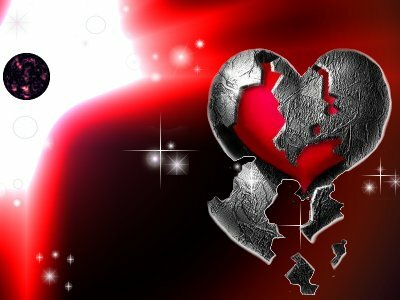 The broken heart I received from my high school crush was a precursor for the heartbreak of my first marriage but paled in comparison. High School crush and I went to the Winterball together. FYI: I have never been escorted to an event by the same guy (so you have three guesses as to which date I'm talking about). Every semi-formal/formal event has been with a different date and ALLLLL were gentlemen. How many girls can say that? I hope all of you readers can! I met him in the 7th grade. We had the same P.E.,English and Hawaiian History class. We've had the same teachers all throughout intermediate and high school. I was never quite into him in intermediate. I was still a tomboy and he was, well, just a boy. The oddest thing happened over the summer between freshmen and sophomore year... we both kinda blossomed. I put away my tiger shorts and gym shoes and traded them in for cute jeans and pretty sandals. He, on the other hand, rid his body of the baby fat and turned into HUNK #1. It's that magical transformation that happens with every teenager. One day you just stop being your old self. The world begins to look different. We were really good friends. We'd pass notes back and forth in the classes we had together. In the ones that we didn't have together, he'd write me a letter and I would write him a letter then we traded them at recess. Sometimes we'd eat lunch together. My friends and his friends were all good friends. After school we would sit in study hall together. We would run together during track practice. During the football season, he would look for me after every game. We'd hang out before he went back to the locker room. He would wait with me in front of the gym until my ride came to pick me up after practices. He was a gentleman in every sense of the word and I was smitten! As is the case with most smitten, teenage girls, I fell for him. Fell for him in a teenager-ee, high school crush, innocent kind of way. It was all very sweet. Sophomore year passed and I had the entire summer to cool off. This was when summer break was actually three whole months. Ahhh... those were the days. Junior year came around and we picked up right where we left off. By December we agreed to go to the Winterball together. That's where we first held hands. Our pictures turned out really nice too. Everything was downhill after that. I don't quite remember what happened. Friends were playing messenger between us and trying to prod us into a relationship. I was for it but embarrassed to admit it unless he would admit it first. It was one of those things! Our friends getting involved kinda screwed up our friendship. We ended up parting ways and my heart was shattered. It's not like we were in a "committed" relationship. We didn't pledge to each other that we'd be girlfriend/boyfriend but we did spend almost every free moment at school together. And all of a sudden it came to a complete stop. What halted it was another girl. His heart had wandered to another camp. At the time I was so broken by it but looking back on it now, it was all so sweet. I recognize him as my first love only because he was my first heartbreak. We were never the same. Even now when we see each other around, it is cordial but not warm and friendly. He was a great guy back then and is still qreat guy now. Really though, it was a learning experience. Well I'm clueless since I didn't meet u until ur senior year. Gotta love those friendly interventions though. Always with the best intentions.. u gotta love 'em! Does his name start with an "S"? It's hard to forget your first love and those feelings of flying in the air. . . at least that's how I describe it.